Tang yuan (glutinous rice balls) is something my mother made for me when I was child and I always loved how chewy they were. She would make a complete meal from one batch of tang yuan by creating a savoury version followed by a sweet version for dessert. This makes a great starter as part of a big shared meal or even a light dinner. Add pork bones and 5 cups of water to a large saucepan. Bring to a gentle boil and reduce to a simmer for approximately an hour. Half way through the cooking, add the shiitake mushrooms (stems removed), spring onion stems and ginger slice to the stock with a pinch of salt. Reguarly skim any impurities from the stock to keep the stock as clear as possible. 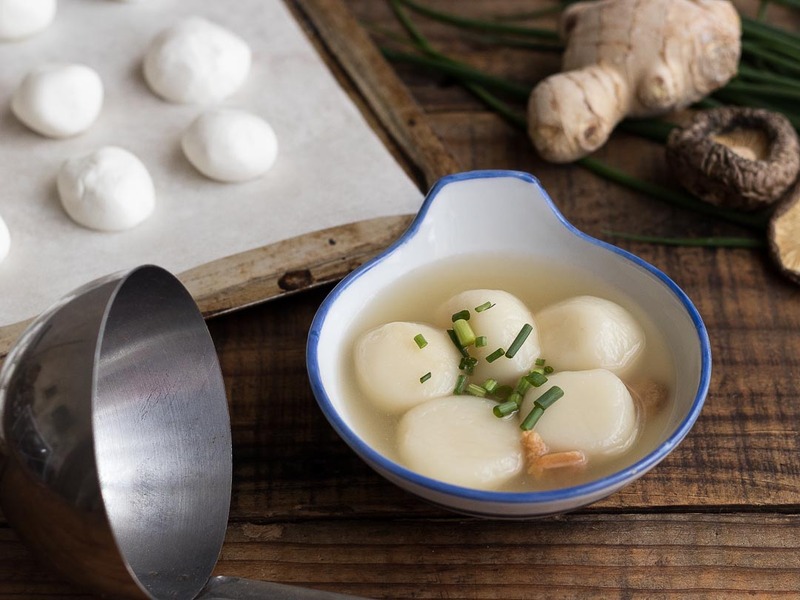 As the stock is cooking, prepare the tang yuan/glutinous rice balls by placing the glutinous rice flour in a mixing bowl and pour in the water. Mix everything together till a dough is formed, if it’s too dry add a little extra water but if it’s too wet, add extra flour. The dough should be soft but when you take a piece and roll it into a ball, it should hold it’s shape. Turn the dough onto the bench and lightly knead it for less than a minute. Pinch approximately 1 tablespoon of dough and roll into a ball shape and place onto a baking tray, lined with non-stick baking paper. If you like your rice balls bigger or smaller you can adjust the amount accordingly. Do this for the rest of the dough until you’ve rolled all of it into balls. Remove the mushrooms, ginger, spring onion and pork bones from the soup and skim any extra fat or impurities from the surface. Add the dry shrimp and cook for at least 15 minutes till they soften before seasoning the soup with white pepper and salt. Bring the soup to a gentle boil and cook the glutinous rice balls in the soup, you may need to do this in batches as you don’t want to overcrowd the pot. The rice balls are ready when they float but you can double check by biting into one. The texture of the rice ball should be slighty chewy all the way through with no raw flour inside. Place the cooked rice balls into bowls and spoon over the hot soup and top with the spring onions. I often serve the pork bones and mushrooms on a separate plate for people to nibble on.